The Iconic household name of the mighty 80’s era, the one and the only QUIET RIOT had released a brand new digital album, rightfully titled "10", available everywhere since June 27th through RSM Records. This collection contain six new songs — including the strong new single "Rock In Peace" — featuring the band's current singer, Mr Jizzy Pearl (exLOVE/HATE / exL.A. GUNS / exADLER'S APPETITE / exRATT) and also four tracks including a medley recorded in 2007 in the live situation, with late QUIET RIOT’s founder/singer Kevin DuBrow (RIP) as an ultimate tribute. This is also the first time in 18 years that Chuck Wright (exGIUFFRIA /exHOUSE OF LORDS / exIMPELLITTERI) has recorded with the band, the effort will also be characterised by some guest appearances by exQUIET RIOT famous bassists : the historic Rudy Sarzo (exWHITESNAKE / exDIO / exOZZY OSBOURNE / exQUEENSRYCHE) and the 2006’s “Rehab” record player Tony Franklin (exTHE FIRM / exBLUE MURDER / exWHITESNAKE) who also played in two tracks. The lead guitar player duties once assigned to BLIZZARD OF OZZ’s Randy Rhoads (RIP) & Carlos Cavazo (RATT) are still handled by talented HOTEL DIABLO’s axeman Alex Grossi (exBEAUTIFUL CREATURES / exADLER’S APPETITE) ,while legendary drummer Frankie Banali (exHUGHES & THRALL / exW.A.S.P / exBLACK THRONE ) is still leading the band, guiding in the right direction with the most respectfull commitment to honor the legacy of QUIET RIOT and the loving memory of his friend Kevin DuBrow . The perfect vocal performance by former LOVE/HATE’s Jizzy Pearl is in perfect coherency with the QUIET RIOT popular style and unique DuBrow’s alligator big mouth like method, the songs are crafted in the key of Rock ‘n’ Roll, with the obvious party spirit and could have matched in any Classic Platinum albums such as “Metal Health” or “Condition Critical”, so you must know what to expect by now, right ? 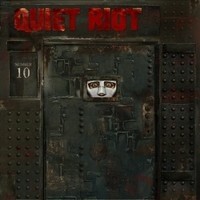 Bang your head, more power is what we all need…QUIET RIOT's Metal will gonna drive you mad!